Vintage Old Egyptian Postcard. Africa Egypte Egypt. 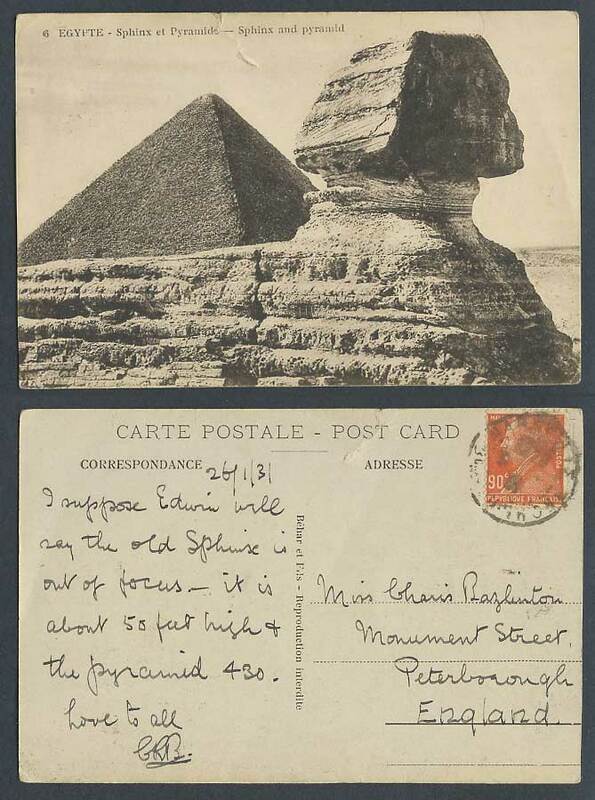 Le Caire, Cairo - Sphinx and Pyramid. Sphinx et Pyramide. 1931. Postally Used with French 90c stamp. Background: Giza (Arabic, الجيزة, transliterated al-ǧīzah; pronounced in the Egyptian Arabic dialect of Cairo al-Gīza; also sometimes rendered in English as Gizeh, Ghizeh, or Geezeh) is a town in Egypt on the left bank of the Nile river, across from the old city of Cairo, and now part of the greater Cairo metropolis. It is the capital of Al Jizah governorate, and is located in the northeast of this governorate, near its border.